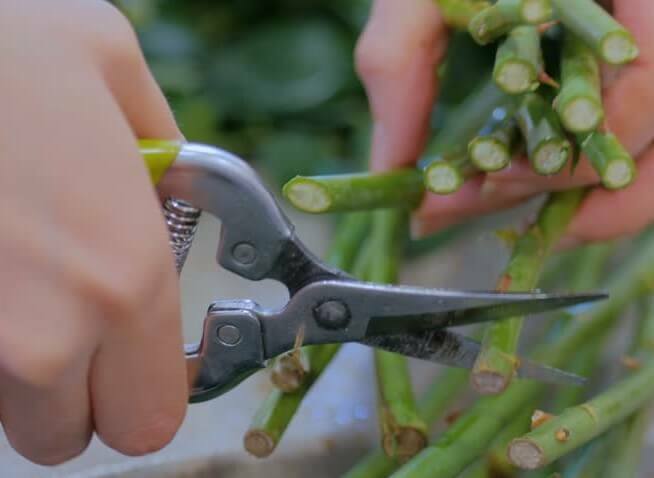 One tool that comes in very handy in any garden and is an important implement to have in the shed, is the secateurs or also known as pruners.. Ideal for tip pruning bushes, deadheading flowers and cutting back roses, this tool is extremely useful and can make life a lot easier for every gardener. The humble secateurs comes in many shapes sizes and prices. It probably is the tool with the widest product range on the market when it comes to gardening. I don’t intend to go over the different varieties of this type of implement in this blog, instead I will be simply looking at five of the best products available for you to purchase. If you want to know more about secateurs, you can find a blog where I describe some different styles by either looking at the category boxes on the right of this website or by clicking here. In the meantime I hope you get some value from my “Garden Secateurs” review. Razor sharp bypass pruning shears. This is an excellent quality product that is great for tip pruning and keeping your rose bushes trimmed. 5). Premium high quality shears that will cut through most 1 inch (25mm) wood easily. 1). Trigger mechanism can make them hard to open. Further Benefits mentioned by the maker. I would have rated these higher as they are an excellent quality tool but I had some issues with the pair I own, and at times found them difficult to use due to there size. I suffer from arthritis and even though the handles were extremely comfortable my hands would hurt from the effort of opening them up. However, if you are young, have small hands but good strong hands, this shouldn’t be a problem. Here we have number 2 of the 5 Best pruners for 2019. Another great secateurs, and one that I currently own and have been using for many years. I have owned several Fiskar models over the years and have done a lot of work with the during my gardening career. Some people don’t like these shear but I think they’re great, I have never had an issue with them. 1). Come with a lifetime warranty. 2). Ergonomic handles for ease of use. 3). Cutting through branches up to 3/4 inch (2mm) is easy with the rotating bottom handle. 5). Will handle a diversity of jobs easily. 1). If you are left handed you will have issues using this tool as it rotates right on the bottom handle. 2). Some people complain that the tool needed sharpening after a year of use. I listed this under a con, but tell me what tool doesn’t need constant sharpening. Further Benefits as mentioned by the maker. If you receive the correct model then I would give it a 9/10. I absolutely love my original model 7036, it is a beautifully made piece of equipment. I hope it lasts me through my gardening lifetime because I won’t purchase the new model. I don’t understand why a company would bring out a newer, cheaper brand. When you’re on a good thing… stick to it. F-2 Classic manual hand pruner. This is another fantastic pruner, and one that I have in my armory. This a light weight long lasting product. I have had mine for many years. Once every year I take it apart and give it a good clean up and sharpening. You’re probably wondering by now, just how many does he own. Well, you must remember that I have been doing gardening for a living for many years. I also have had various staff members over those years. I don’t believe in being stingy on money as these tools go through a lot of wear and tear and need to be able to handle being thrown around, often lost for days and left out in the weather. This one handles all that with ease. 1). A long lasting Tool. 4). Blades are very sharp when new. 5). Ideal for a larger hands. 1). Not for people with smaller hands. However Felco do make one for this situation. The F6. 2). Not really much else I can say on the negative side except they are expensive. More Benefits as mentioned by the maker. This is definitely my favorite tool for quality. I wouldn’t go without one. I realize the price is a bit steep. If you want to stick to ones that cost less then $15 fine, however you will be purchasing around six of those for every one of these. 8″ professional premium bypass pruning shears GPPS- 1003. I’ve never actually owned a pair of Gonic secateurs, however I do have gardening friends that have. Therefore my review on this brand is based on their opinions along with thousands of others that I researched on line. 5). Good for both men and women to use. 1). The retaining screws that hold the lock socket together have been known to strip out. 2). Its one of those annoying types that have the spring constantly pop out. 3). Won’t cut anything more then 3/8 inches thick. Further benefits as described by the Makers. Having never used these myself I had to go on what others tell em. If you’re after a cheaper but reasonable pruner, this might be the one for you. Unfortunately it has some bad habits that professional gardeners hate. With springs popping out and screw coming lose, it’s not an ideal unit for lots of hard work. For this reason I was unable to give it a high score. This is yet another one that I have never owned but a neighbor of mine swears by it so I decided to check out a number of reviews on line. 1). Sturdy and can cut branches to 3/4 inch thickness. 2). Ratchet feature great for those suffering from arthritis. 3). Well made and can last many years. 5) Well priced for the quality of the tool. 2). Some people with small hands find the handle a bit large. 3). Can be difficult to lock and unlock. More Benefits as mentioned by the makers. Again I couldn’t go any higher with my rating of this product, regardless of the fact my neighbor owns one and loves it. To many people have had issues with the size of the handles. Overall its a good tool and if your hands are big. I’d buy it. I picked out the top five for several reasons, the major ones being that either I or someone I knew had used them. In the end I personally believe you are better off paying a bit extra to receive both quality and comfort. I hope you are able to make a choice from the above. However, I did include a cheaper model that would suffice and do the job well. If you didn’t find one in this blog that you think you might like to purchase then there are many more to choose from, simply click on one of the links I’ve supplied and check them out. I hope you enjoyed this review on the 5 Best Pruners for 2019. If you have any questions about these or other gardening secateurs that you might want me to review , please feel free to either comment below or use the comment form in the “Contact Us” page above. I have always been a bit of a scrouge when it comes to buy these kinda tools in my past years, and I have to ask your opinion and experience as to what the lifespan is of spending extra on a high quality set of secateurs. Also I’m interested to know if you bother to sharpen them some how? I have a big garden and I really never pay attention that I should improve my garden equipment. I like this review because I can see and choose the best ones because I will for sure buy one for me and my dad who enjoy to work in garden. Garden Lite is definitely my choice primarily because of such nice design. Glad I found this–I do need to get some secateurs by next spring! It actually might be helpful now to prune up my dying flowers. I have a recovering black thumb, but I desire to really improve with my gardening skills, so I’ll be saving your website! Do you have any info about indoor gardening? I’m becoming more and more interested because I live in MN, which means our growing seasons aren’t as long as some, and trying to get produce in the winter is expensive and not anywhere near as tasty and fresh. I’d love to invest in some sort of set up (within reason!) that could allow me to grow my own veggies year round. Like hydraulics or something (is that what it’s called? Hydro-gardening? I’m not remembering). What are your thoughts on that? Hi Jim, i really like this post, you have presented a number of different secateurs for the customer to check out with research on each. I like to buy the piece i can most afford, as i have found the cheapies just don’t cut it, so to speak. I have had Felcos over the years and found these to be reliable and durable. Definitely not the cheapest but i have gotten many years good use from mine. Thanks for your review i thoroughly enjoyed it, all the best. This is a wonderful product guide which gives important detail information on different tools. I’m not a farmer but my dad is. He has different tools for different farm jobs so am not new to such tools. When I was growing up, we used to work on the farm and I have noticed one tool you have highlighted here which we commonly used. I even didn’t know it’s English name, I only knew it in vernacular. From your review it’s “Felco,” and we used this tool for many years till I left home to work in the city. It seems to me that this tool as you said in the Pros that it’s truly very durable and handy when it comes to performance. I also noticed another tool you have talked about ‘Fiskers’ which looks similar to Felco and I think my father would love it as a gift. I wonder if you think this is a good choice or not? Although I’m too much of a gardening man myself, and this is probably the most I’ve read up about such tools as these, you kinda had me a bit captivated with how interesting and detailed they could be, as well as your experience with these tools and variety you had available to showcase. I honestly admire people who can go out on a multitude of occasions and do work with their hands, no matter how little, like gardeners. I can appreciate this post! Thansk for this helpful guide and informative secateurs reviews, it came just in time as I am looking to upgrade and improve my garden equipment. I truly appreciate these short and detailed reviews about each item, great job! So far the Garden Elite and Blue Ape caught most of my attention due to great build quality, high longevity and the design of these two is very visually appealing I won’t lie! However, I am a bit worried about Blue Ape’s ratchrting part wearing out and becoming difficult to use, should I be concerned about it and how long approximately would it take it to wear out? Hello Jim, thank you for the review , it contains much info about Secateurs which are needed for our gardens. My aunt is an avid gardener and I have been looking for ideas for a gift for her. I think a secateur would be perfect!